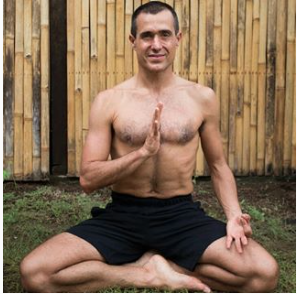 In this workshop, Pedro will lead you through the different aspects of meditation, so that can you learn to deepen into your own practice. You will be guided through a Chakra meditation using visualizations, mudras and mantras to balance the energy centers of your body. The last part of this workshop involves a Mystic Healing session. Mystic Healing is the channeling and transmission of the spiritual force through a healer. In this energetic meditation practice you will be touched in a very gentle and loving way, which creates a space of safety for you to relax and surrender - feeling fully held and loved unconditionally. Through the contact with a powerful spiritual energy, you will go through an expansion and elevation of your consciousness where you'll obtain direct experience of your inner self. Pedro discovered his spiritual path when he met his Guru in 2002. He then started an intensive meditation practice and discovered his Dharma - to serve others unselfishly and embrace the tradition of Yoga as a way to fulfill that purpose. During the last 16 years, Pedro has been offering Mystic Healing sessions which have helped people to release tension from their bodies, bring stillness to their minds, and experience a deep connection with their inner Self, as part of the integration process that Meditation practice brings to our lives.